Before adding round silver beads. 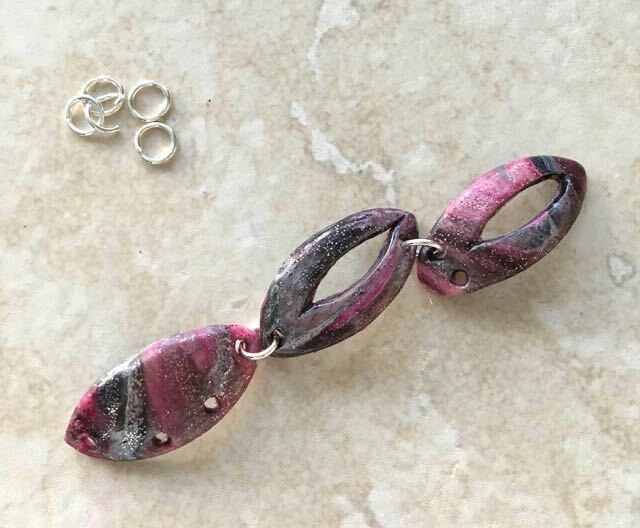 This polymer clay jewelry project is a little like puzzle making and a little like paint by numbers. I've made it easy to create with my free template. It numbers all the beads and shows you the arrangement for each one including where to place the holes. Since some small, medium, and large pieces are solid and some have cut outs in them, the template helps you to clearly see which go where. Round silver beads and jump rings are used to connect the clay pieces. Baking them on a metal mold, gives them their shape. Mix translucent clay with alcohol ink and silver glitter to create the sparkle in this unique and fun to make necklace. This project can be cut with the Silhouette Curio machine, the Cameo 3, and other machines. Download the cut file above that's right for you or the pdf file which includes instructions and the bead templates. Directions for Silhouette users (SC) and craft knife users (CK) are included in this tutorial. Directions without initials apply to all crafters. step 1 - Download and print out the necklace template. It includes numbered pieces to help you arrange the beads. Also included is the placement for the holes on each bead and a list of how many of each type bead are required. CK - Print the bead templates onto card stock. Cut them out with a craft knife. SC - Download the cut files. step 2 - Roll out two ounces of Premo Translucent clay on the #5 setting of the conditioning machine. The clay will be long. Cut it into two equal pieces and over lap the long edges to form one piece. Roll over the seam with an acrylic roller to combine the clay. With a brush, spread Plum alcohol ink on the clay. step 3 - Follow with Silver and Black alcohol ink. Use less of the black to avoid a muddy color when the necklace is complete. step 4 - Sprinkle the clay generously with silver glitter. Wear disposable gloves to avoid ink stained hands and nails. step 5 - Enclose the glitter by folding the clay once horizontally, then vertically. step 6 - Form a tube with the clay. Twist it then roll it onto the work surface with your hands. Make sure there are no air pockets in the roll. If you find any, push the roll in from the left and right side and roll again. Twist once more then flatten slightly. Cut one-inch wide slices from the oval shape. step 7 - Roll the slices with an acrylic roller to thin it enough to feed into the conditioning machine. Roll the clay piece on the #2 setting. step 8 - SC - Select all the beads in the file. Copy and paste a duplicate set off the work space. Place your clay pieces on the shiny side of freezer paper. Press the paper on the machine's cutting mat. In the Silhouette window arrange beads to match the clay placement on the cutting mat. Discard bead shapes not being cut. You can replace them when needed using the copies. Use the blue #10 setting on the deep cut blade. In settings choose 3 platforms, speed 3, thickness 33 and send the job to cut. Place deli film over the cut clay. Flip it over. Remove the freezer paper. Cover the clay with another sheet of deli film. Flip it again and remove the front film. Use the back film to push out the cut clay pieces. step 9 - CK - With your knife, cut beads from slices using the stencils as our guide. Cut as many slices as needed for all beads. Referring to the template, follow the numbers in sequence to keep organized and know which sizes you need. Refer to the template for hole placement and use a small hole cutter. step 10 - With a sculpting tool or the back of a small spoon, smooth and bevel the bead edges for a more finished look. step 11 - Drape the clay pieces on medium and large size Sculpey molds and bake at 275 degrees for 30 minutes. Dip them in a cold water bath for 5 or 10 minutes. Pry them from the metal with the edge of a craft knife. Lightly sand rough edges and buff to a shine with a Dremel tool or an old tee shirt. step 12 - Connect the beads with 7mm jump rings. Slip three 4mm silver beads on the rings before closing them. (not shown) More space may be required between some beads to prevent them from overlapping. Connect those with 8mm rings. step 13 - Add two 8mm jump rings to bead #1 and #18. Attach two equal chain lengths ( 5.25" or more depending on your neck size) to the 8mm rings on each side of the necklace. Adjust the fit if needed by removing or adding links to the chain pieces ending with the same number on each side. Add a lobster clasp to one end of the chain and a 7mm ring on the other. Premo Translucent Clay - 2 oz.